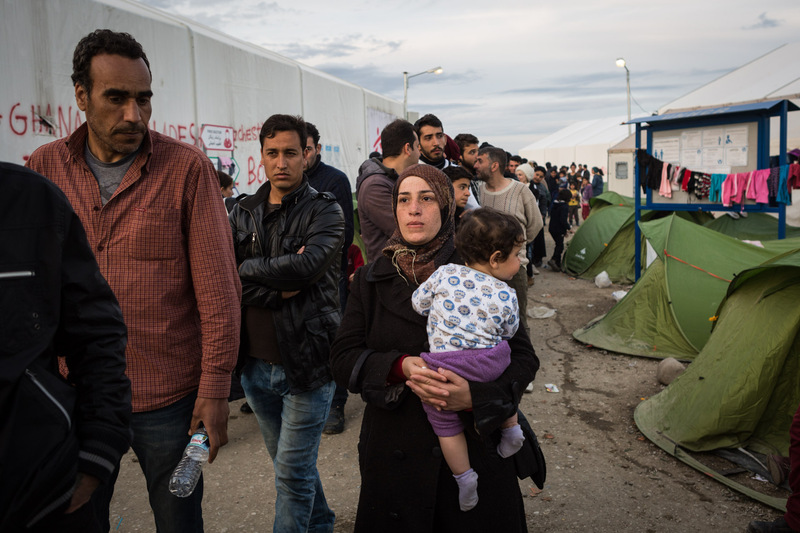 Like for many other refugees on their way to Western Europe, Greece is their first glimpse into the European Union. 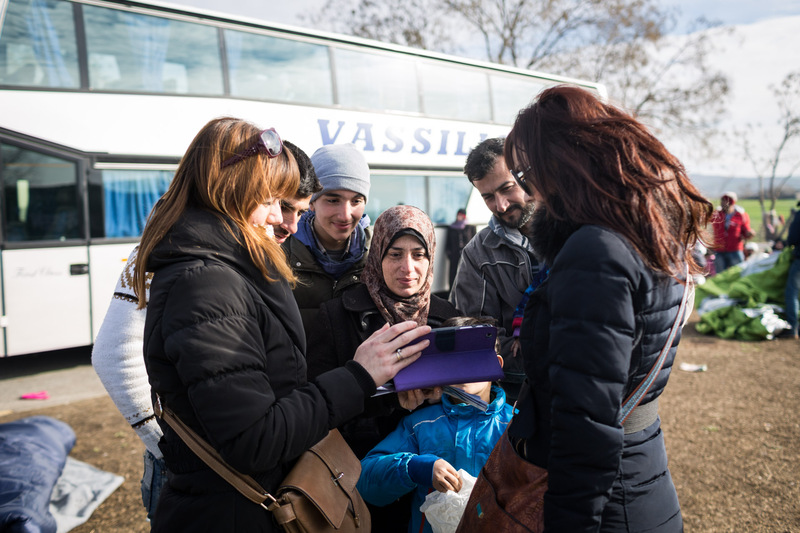 Here, a couple gets their picture taken on the ferry from Lesbos to Athens. Because I met the al-Turkis only minutes before embarking the ferry, I did not immediately start taking photos of them. 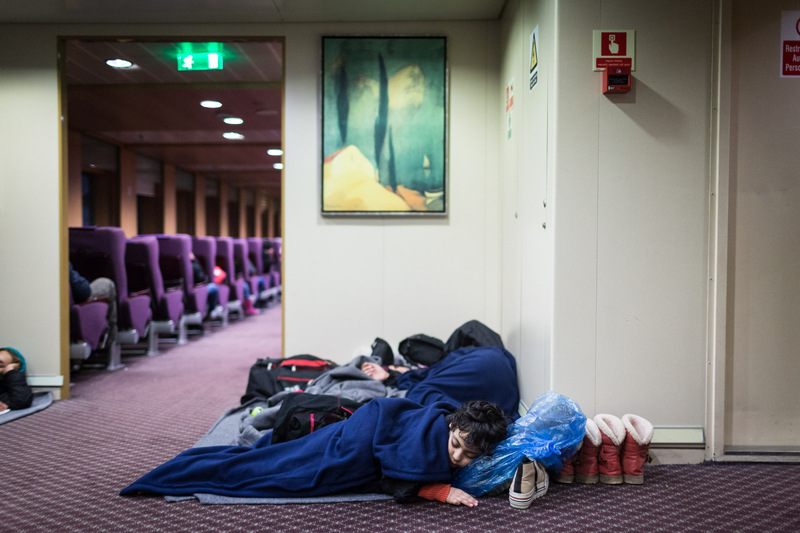 This photo serves as an example of the conditions on the ferry to Athens. 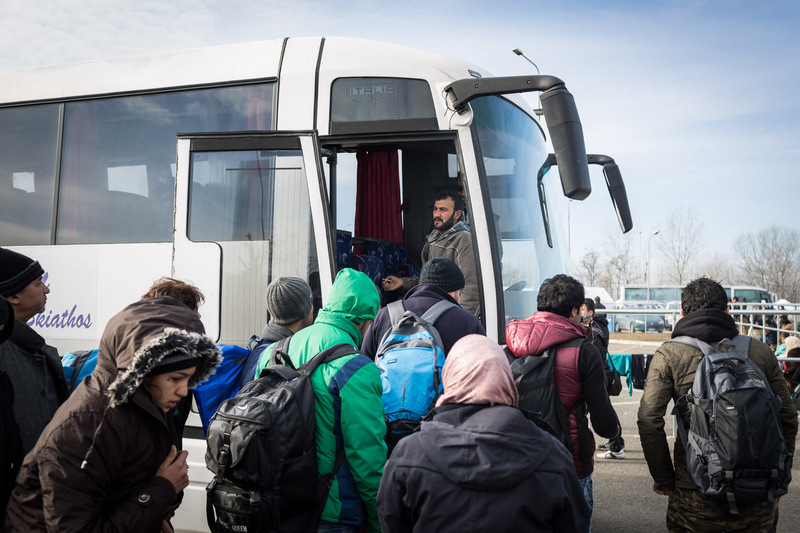 Basem, the father of the family, stands confused in the door of the bus, that was supposed to take the family from Athens to Idomeni. Instead, the bus stopped at a gas station 30 kilometres away. 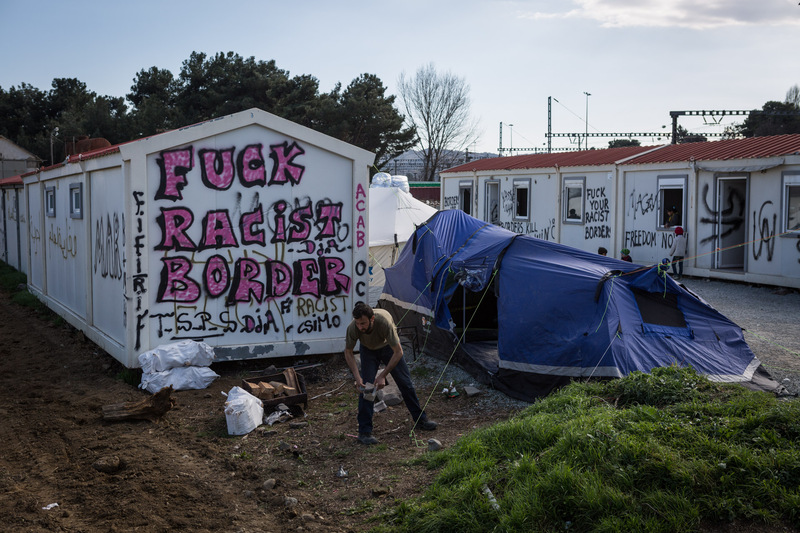 Greece ordered all buses with migrants to stop here. Even at a gas station without any infrastructure capable handling nearly 2000 people, a group of Christian missionaries approach random people, also the al-Turkis. My first evening with the family, after we've spent the night before in the bus to the border. At this point there is still hope we would get to Macedonia within the next few days. 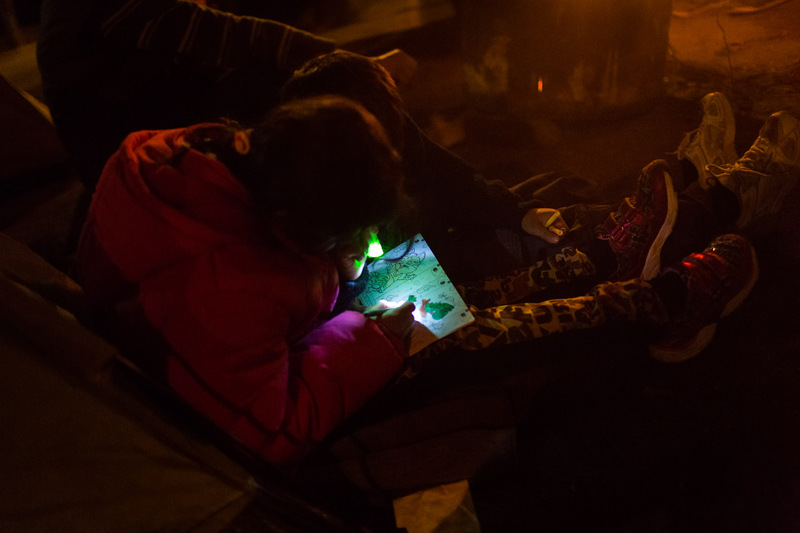 Basem's daughter Noura enjoys a colouring book with the help of a flash light. The next morning in Polycastro, rumours are spreading that the border would be shut down very soon. 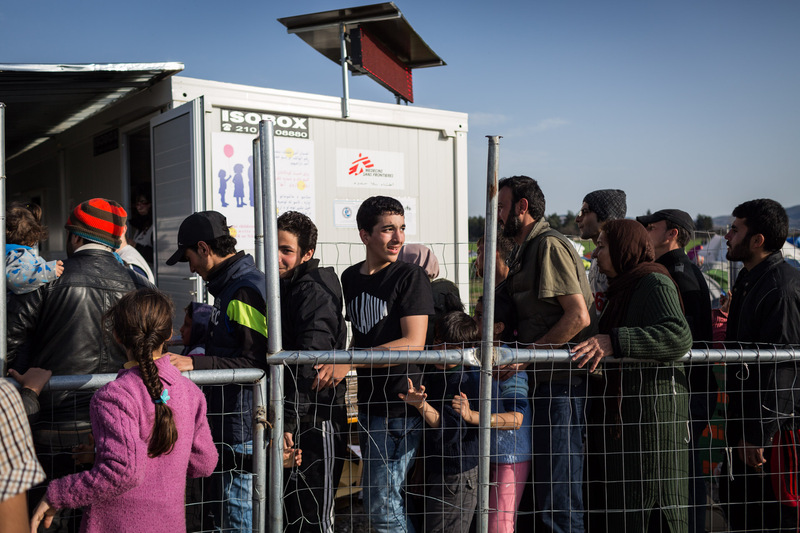 The rumours spread throughout the whole camp at the gas station and within 90 minutes, 2000 people decide to make their way to Idomeni on foot. Basem talks with fellow refugees what to do. 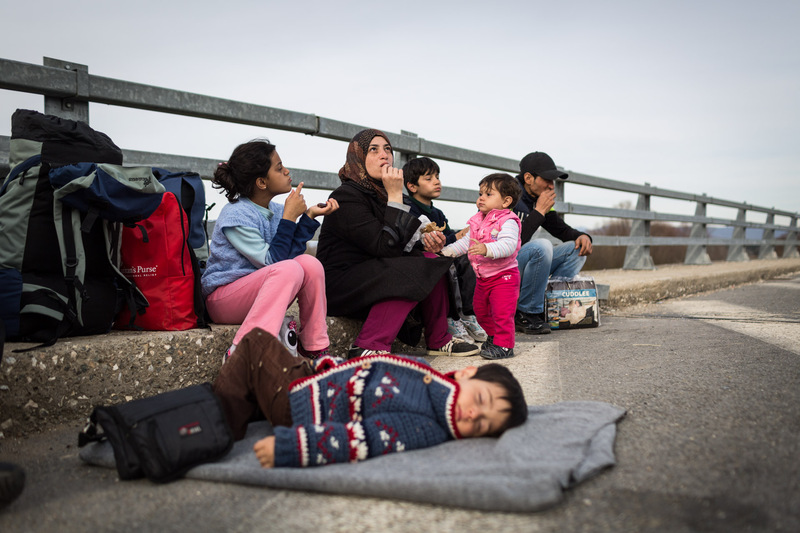 The family on the freeway from Polykastro to Idomeni. 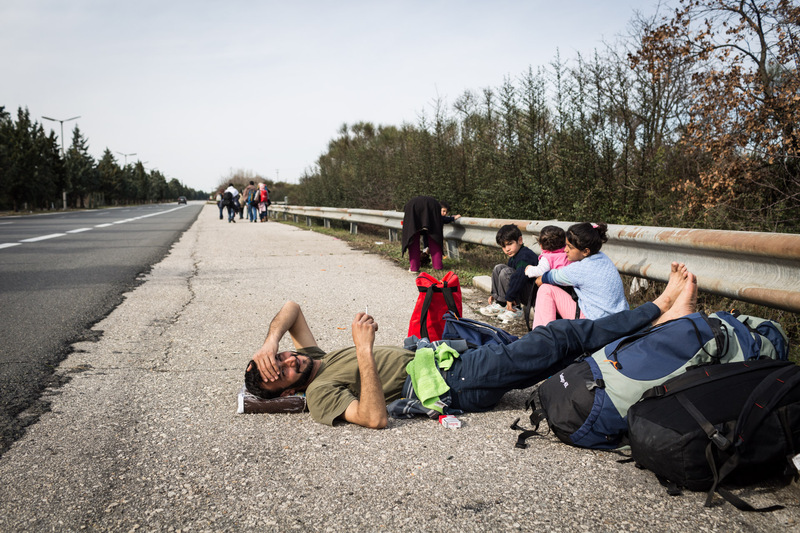 It is about 30 kilometres to the border, but everyone is excited to reach Macedonia soon. 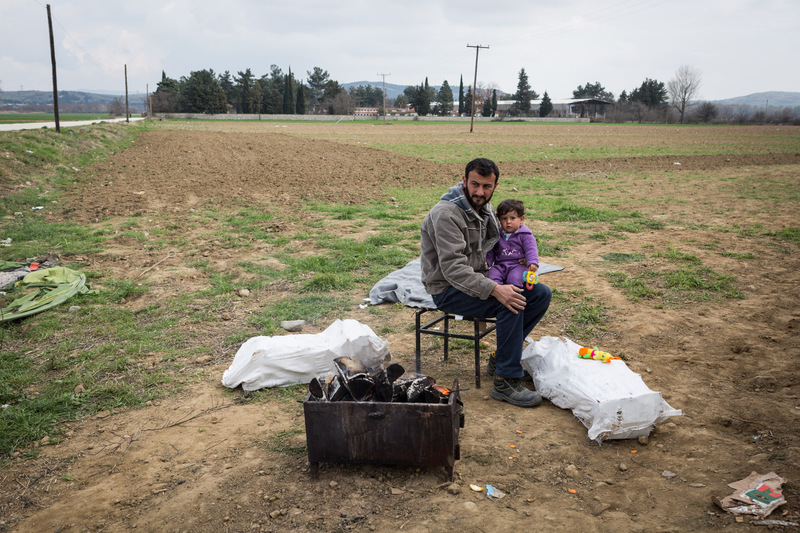 Ahmad and Mohammad, two close friends of the al-Turki family, rest under a tree on the freeway to Idomeni. With four kids, his cousin and his wife to take care of, Basem needs a few minutes rest on the tarmac to recover. 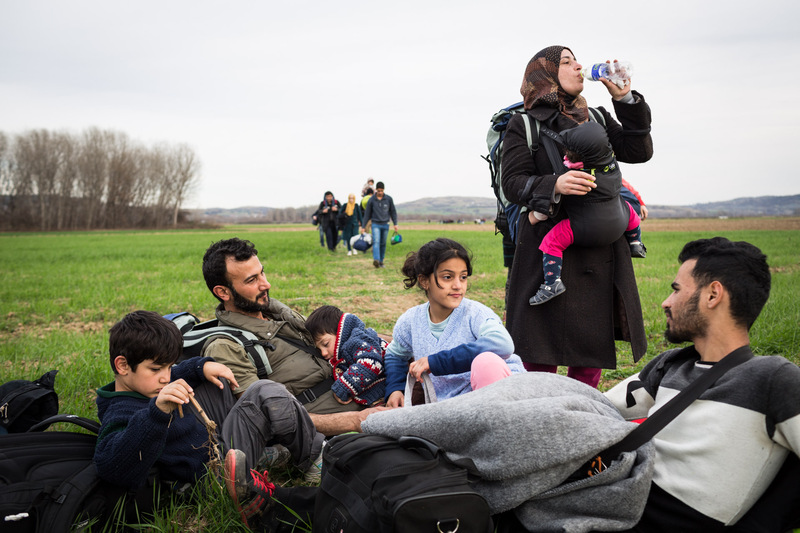 Close to Idomeni, the family takes another rest. At this point, the smallest kid of the family, Hamudi, falls asleep the minute he can lay down somewhere. 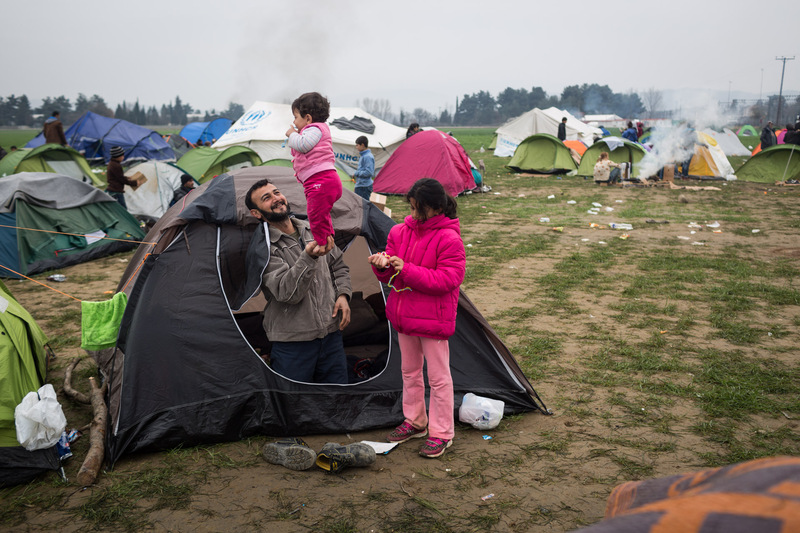 The family takes a last break on the farming fields that surround Idomeni. 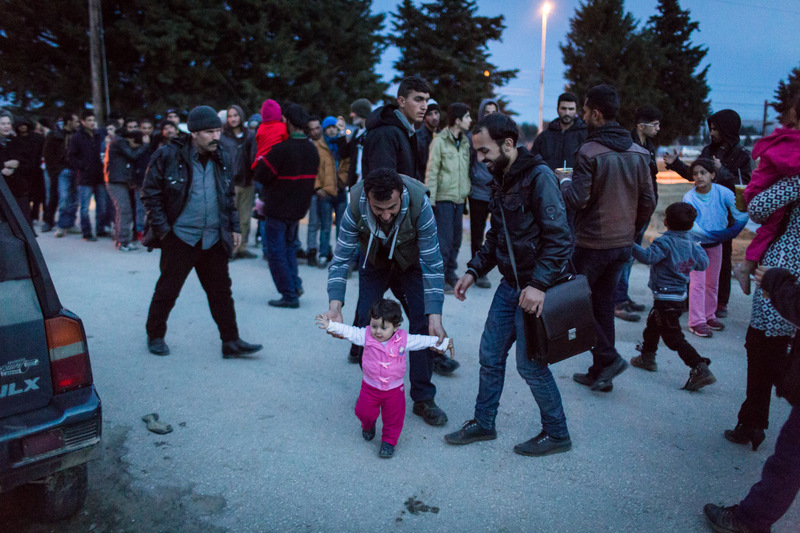 The family arrives in Idomeni. Basem sets up the two tents for the family: Nine people, plus me. 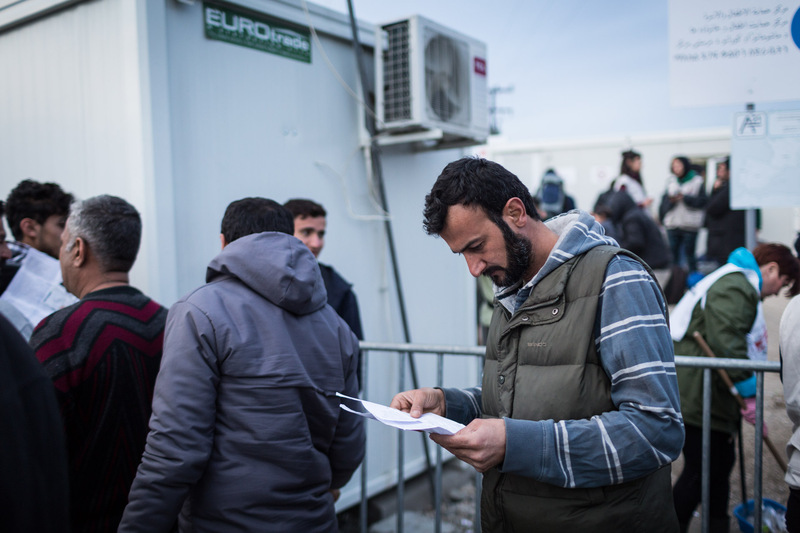 Basem stands in line to get his papers stamped by Greek police in order to get a waiting number. This number will indicate how long his family has to wait to cross the border. Basem examines the paper that Greek police handed him. By the time he got his paper, approximately waiting number 63 was processed. His family got number 103. 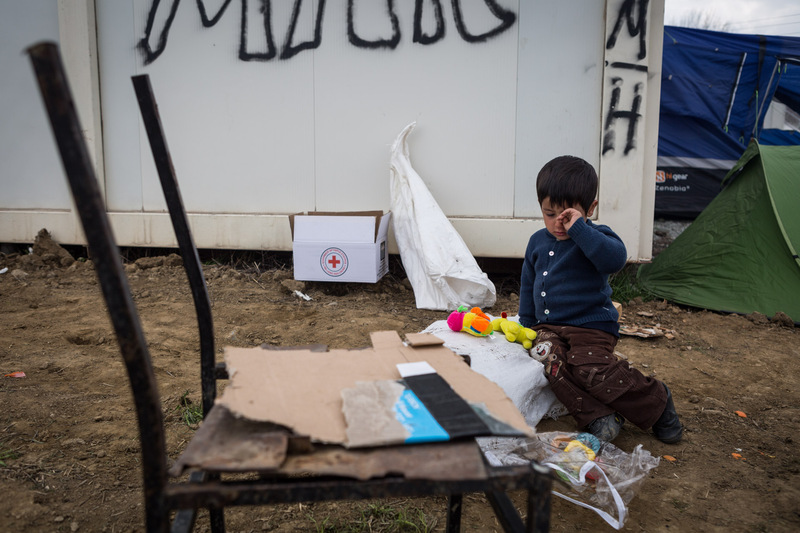 The life in Idomeni camp consists mostly of waiting. While waiting for food, Basem plays with Lilly. 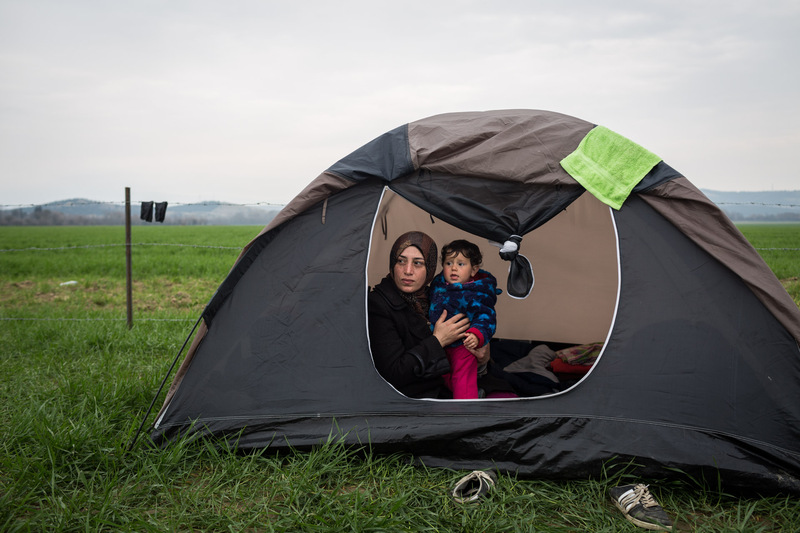 By the end of February, Idomeni was inhabited by maybe 2000 people. It was easy to find free space. Here, Basem puts Lilly in his big shoes. Basem used to work as an engineer in a substation in Syria. He came to Greece in the shoes he needed for work. 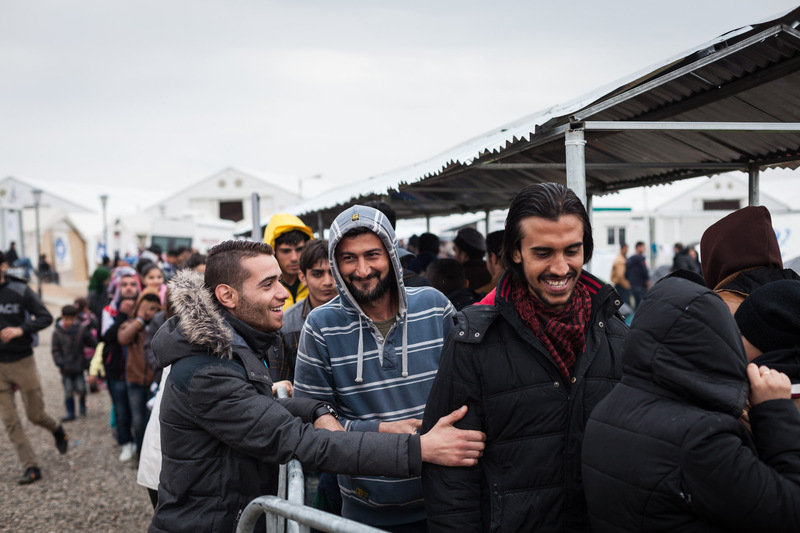 Basem's cousin, Abd al-Rahman, stands in line for a meal. Abd al-Rahman is always in a good mood, no matter how wet his shoes are or how long he just had to wait in line for a volunteer to tell him that there is no food any more for today. Khulud, Basem's wife, takes care of Lilly, while Basem reads a Qu'ran in the background. The al-Turkis are Sunni Muslims. In more than two weeks, I never saw them pray once. "I love it, when my husband reads the Qu'ran", says Khulud. "He is very calm and at peace with himself after reading." Basem plays with Lilly after waking up. 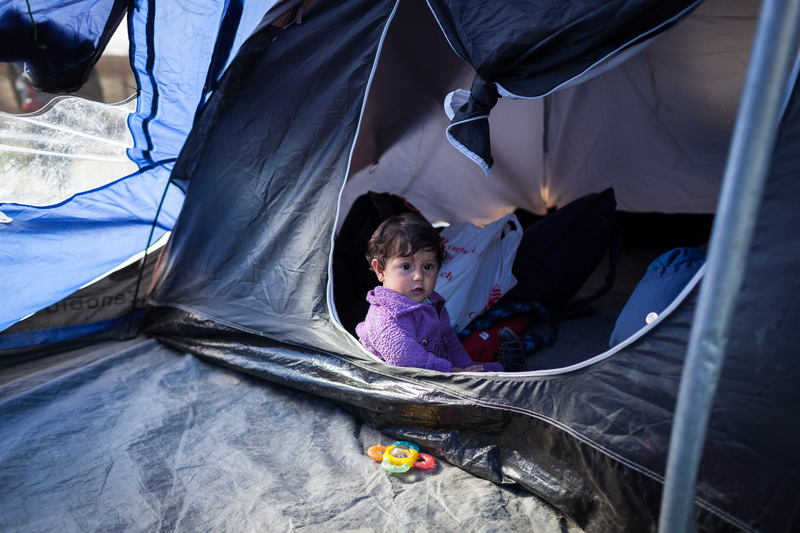 Because Khulud studied English literature and knows some English too, she is sometimes approached by media in Idomeni camp. Basem stands by on the left. He adores his wife very much for being a sophisticated reader and admirer of literature. Khulud and Lilly in the tent after having breakfast. After she runs out of clean clothes, she stays mostly in the tent. 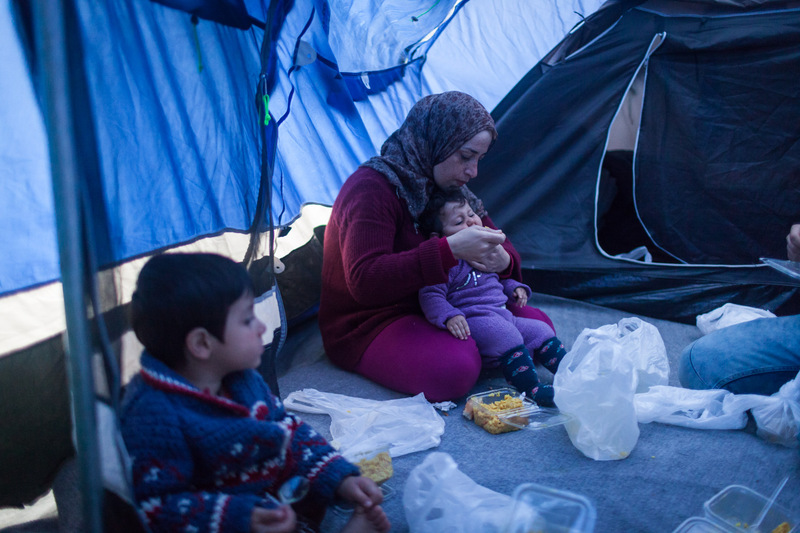 Khulud feels ashamed because in Idomeni she doesn't have infrastructure to clean her clothes. 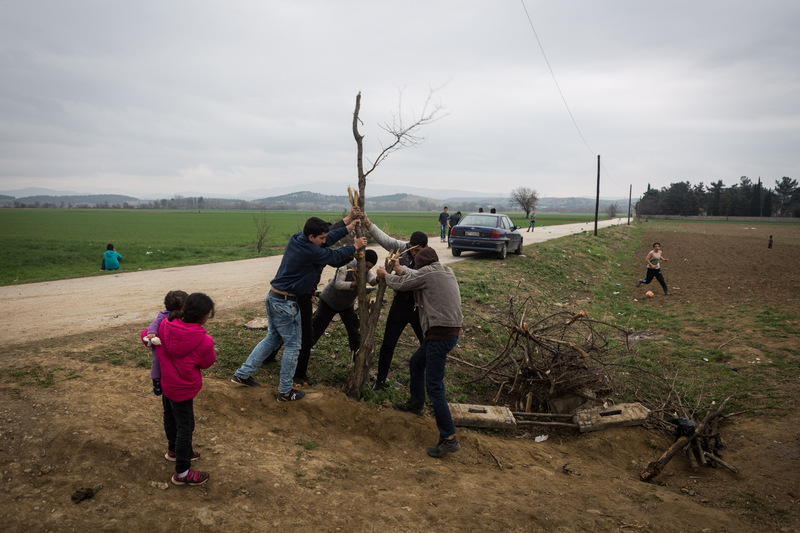 Days in Idomeni are a lot of routine. Basem is appreciated among the other people in line, because he always shares cigarettes and a laugh. 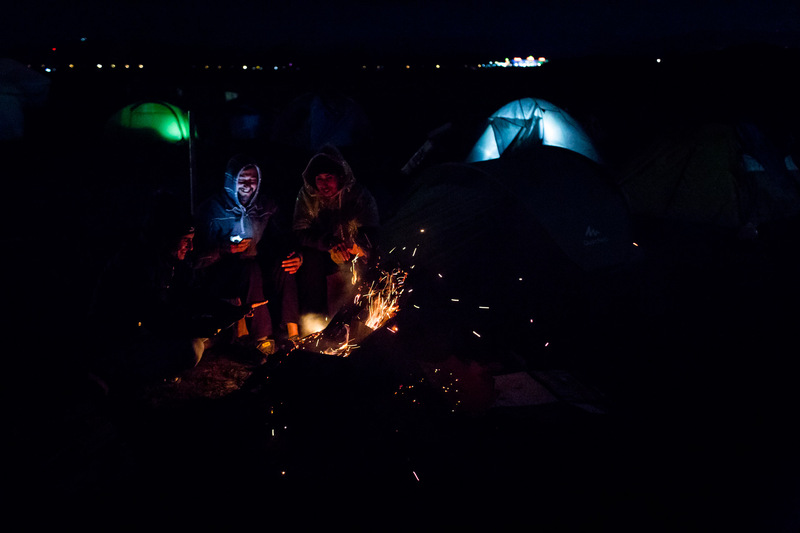 The nights in Idomeni were cold as 2 degrees Celsius sometimes, so fire is an important source of warmth. Every evening, Basem, Ahmad and Mohammad go searching for fire wood. Basem loves the evenings around the camp fire. "People sit together and enjoy the fire", he says. "We did this in Syria too, but only on weekends. Here, we do it every day." 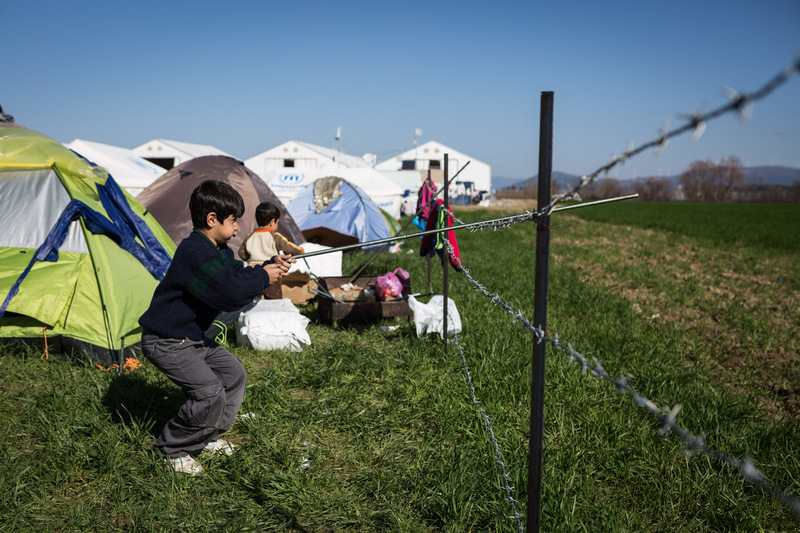 Baker, Basem's oldest son, plays at a fence in Idomeni. 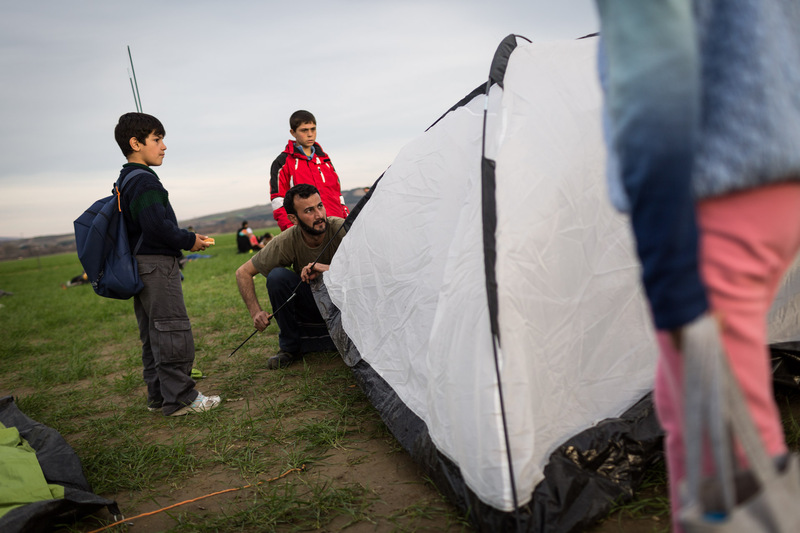 After the amount of refugees in Idomeni passed the mark of 10.000 people, Basem decided to move the tents. 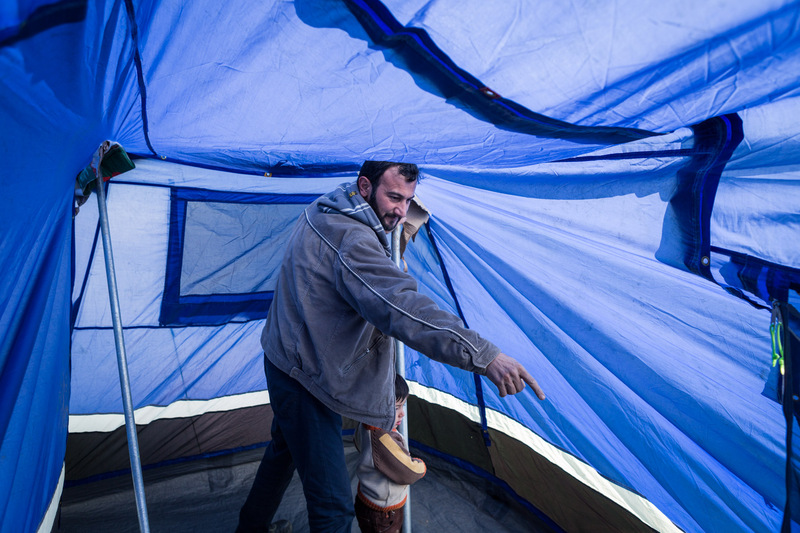 Also, he found a big broken tent, repaired it and set it up further away from the border to have more privacy. Lilly in the new tent. Basem finished setting up the new tent. It fits the two smaller ones and leaves a recreational space for the family in between. Noura. 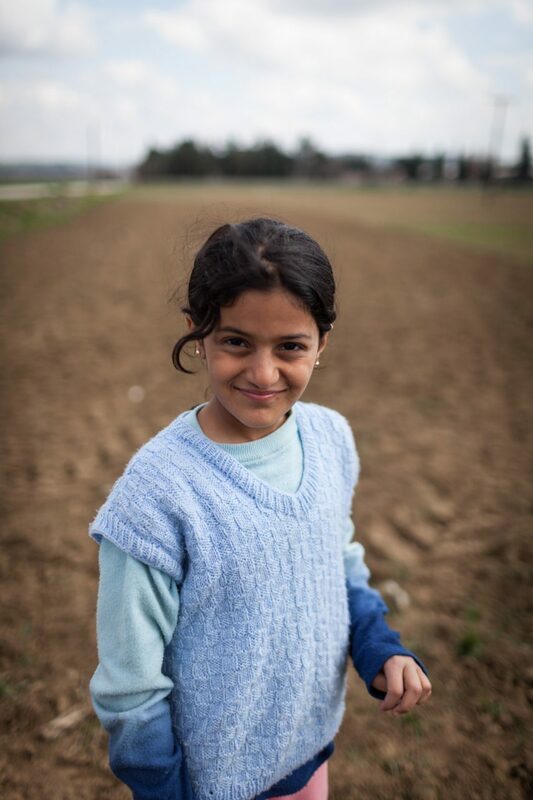 The journey from Syria to Greece quickly taught her how to act independently. She barely needs her parents any more to get through the day. Hamudi rubs his eyes. 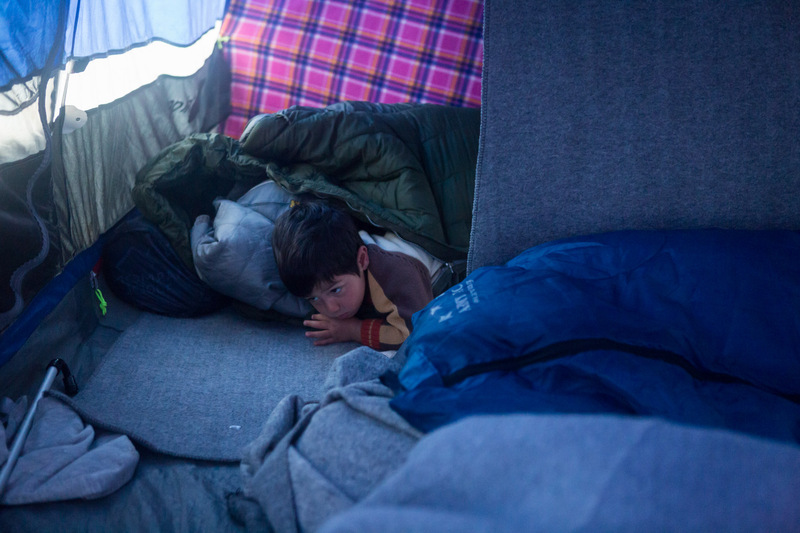 The nights are getting so cold sometimes that no one is able to sleep for hours, because the sleeping bags and blankets are too thin. Basem holds Lilly on a field behind the tent. Hamudi wakes up very early in the morning, unable to find sleep. In some nights, the temperatures nearly drop to zero. 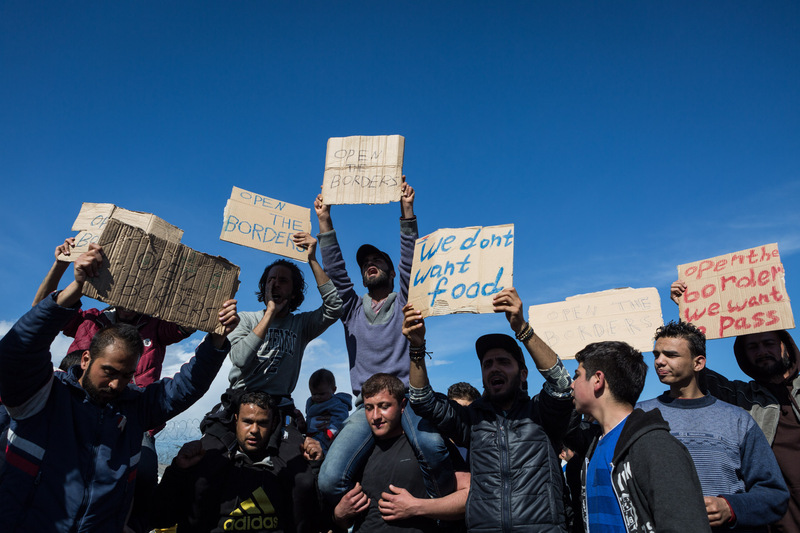 After a week in the camp, protests start to emerge. Basem is always part of the demonstrations in the camp. He holds a sign on the far right. Basem jokes around with Hamudi while waiting for soup. Khulud stands in line for tea. After a week, I catch her off-guard more often than before. She is tired, and as a woman, is more affected by the lack of infrastructure and clean water in the camp, than the men. Khulud feeds the kids in the tent. Unable to find enough fire wood to burn in the evening, Basem, Abd al-Rahman, Mohammad and Ahmad start to uproot a small tree nearby. Basem takes part in a vote during another protest for the opening of the border. 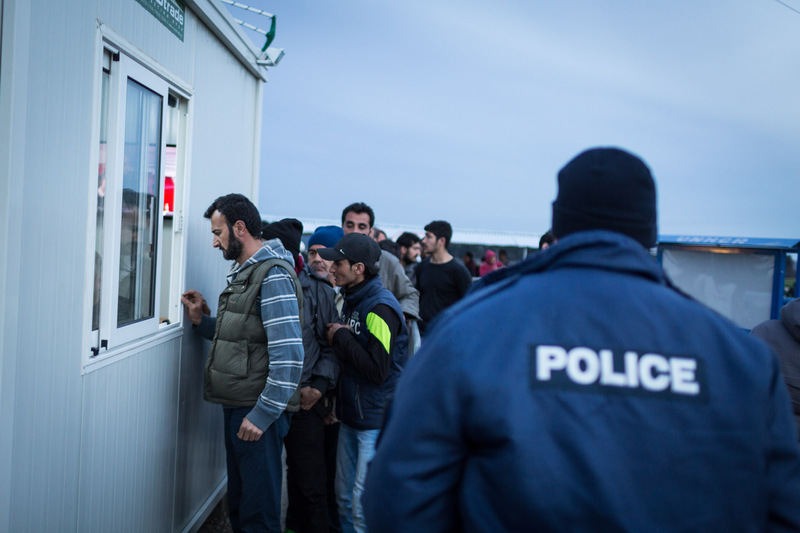 Earlier this day, they have been tear-gassed by Macedonian border police, trying to cross the border. 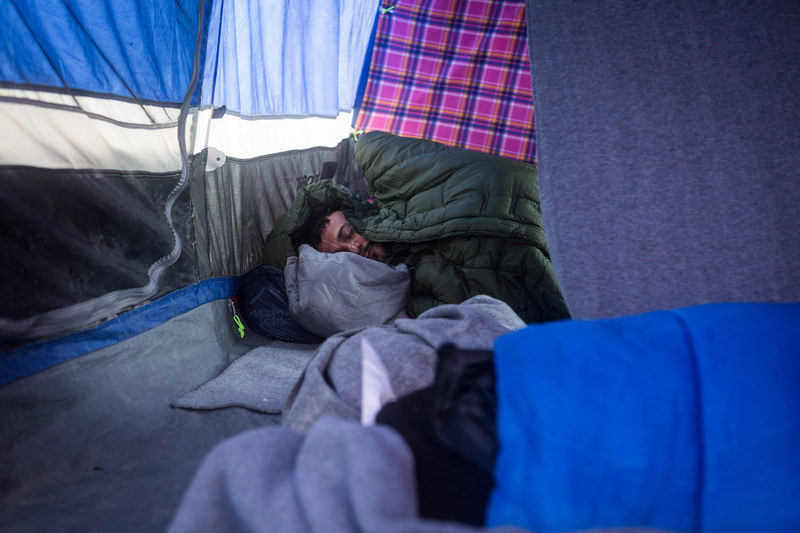 Basem sleeps in his sleeping bag during a very cold night. 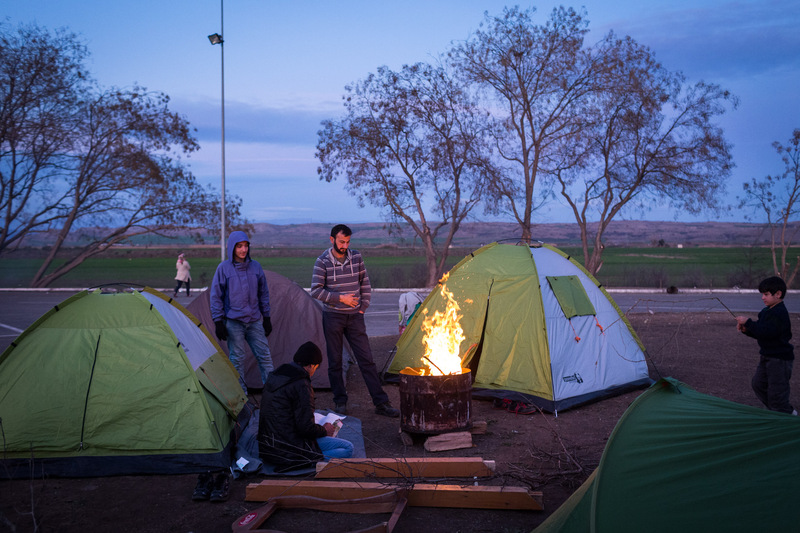 In February 2016, after one semester of Arabic studies in Lebanon, I decided to travel to Lesbos, Greece, in order to do documentary work for an update on the Balkan migration trail to central Europe. This time I wanted to focus on one family to tell the story. In Mytilini, the port of Greek island of Lesbos, I hit pay dirt: The al-Turki family. The al-Turkis are a Syrian family from the contested city of Deir ez-Zour in eastern Syria. The family consists of the father Basem, his wife Khulud, and the kids: Baker, Hamudi, Nour and Lilly. Also travelling with them was the cousin of Basem, Abd al-Rahman, and two unrelated, but close friends of the family, Mohammad and Ahmad. Members of their family already made it to Düsseldorf in Germany, and they were bound to join them. 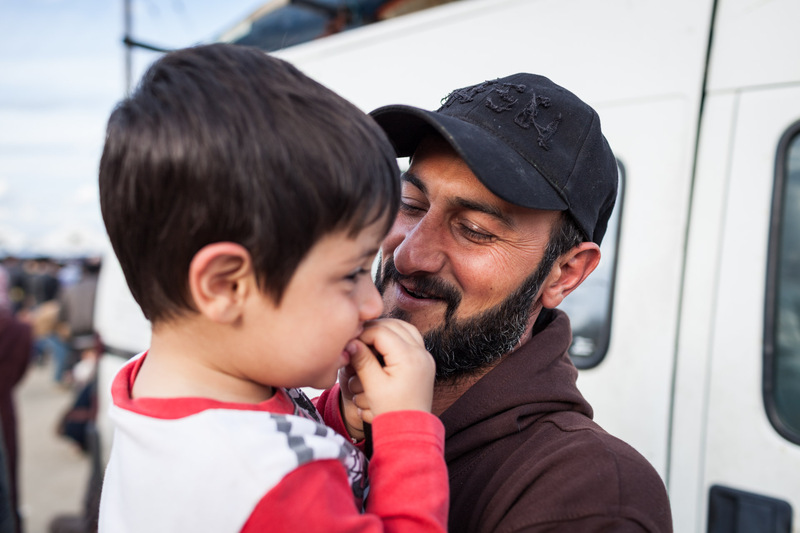 Like many before, they crossed Turkey and the Aegean to travel to Lesbos, where I met them. 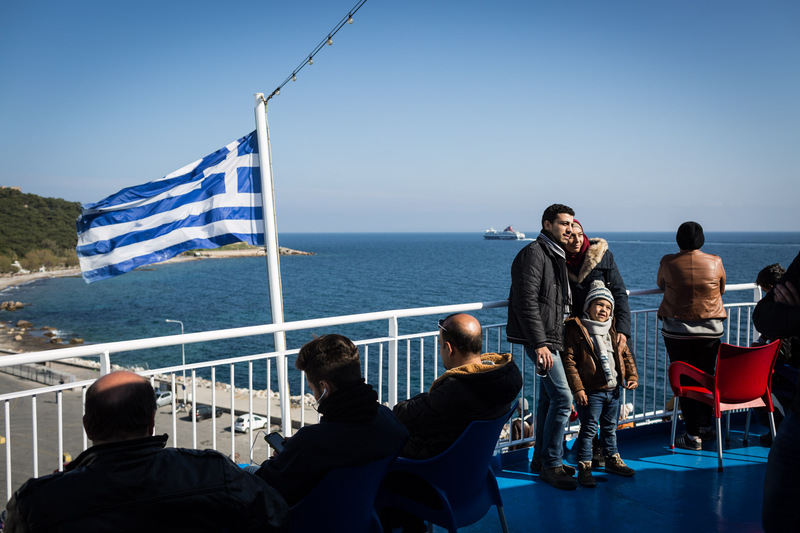 We crossed the Aegean again, this time on a ferry to Piraeus, Athen’s port. From there we took a bus to Idomeni, still expecting to reach Germany within the next few days. 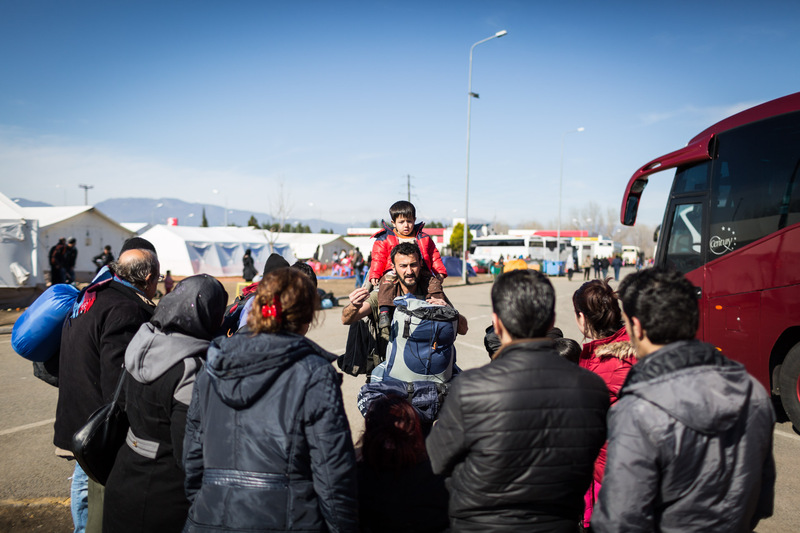 By the time we reached Idomeni in late February, the border to Macedonia was still open, but the number of people crossing daily was already so low that the family would have to wait forever. 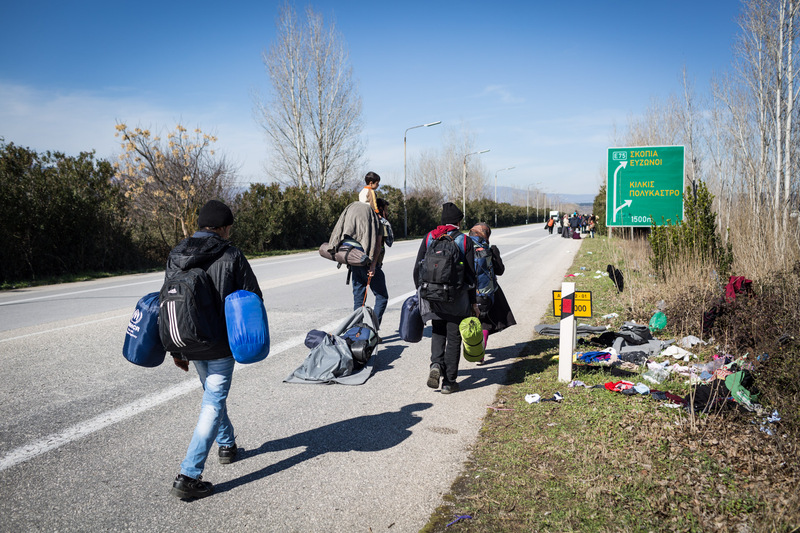 A couple of weeks later, the border was closed indefinitely by Macedonia, making it virtually impossible for migrants to continue their journey onwards. Because the al-Turkis arrived to Greece before the EU-Turkey agreement, they don’t have to go back to Turkey. But they also cannot continue onwards to Germany. 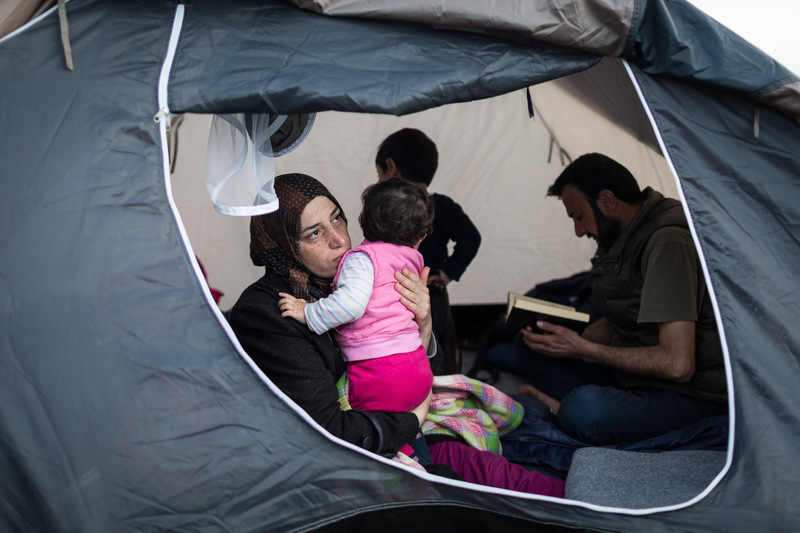 They share the same fate with roughly 50.000 other refugees in Greece. 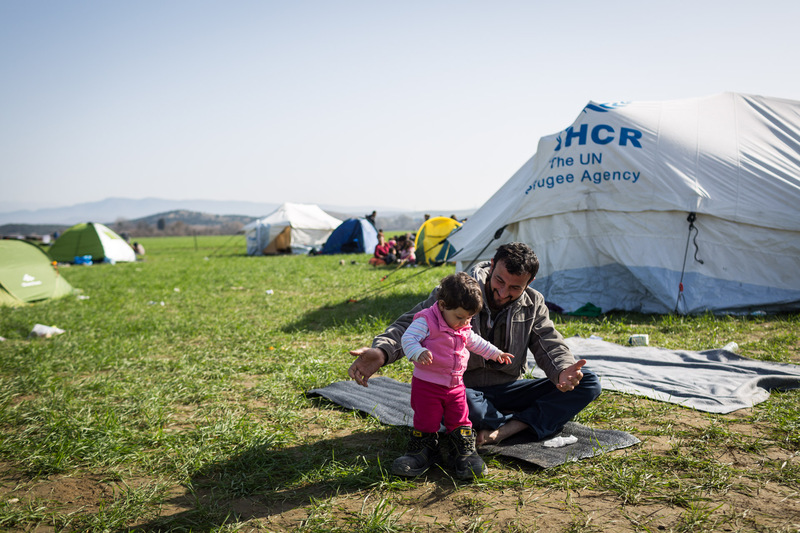 Until late 2017 they were living in a housing unit near Polycastro provided to them by the Greece government. 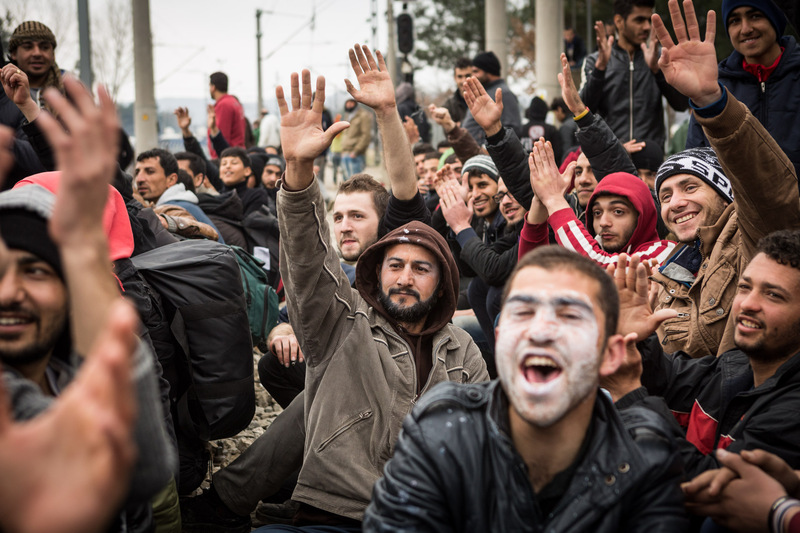 They applied for the EU-resettlement program successfully and now live in Spain, trying to make a living.